Hello y’all! Welcome to this lovely day where I get to share my latest repurpose/ recycle/ salvage/ junking project with you. Today’s project is both lovely and useful! I did a washi tape organizer DIY project, using materials I had on hand. No money was exchanged in the making of this project and only materials that would otherwise have been thrown away were used. So a true salvage style project me thinks. Speaking of Salvage Style Projects….. It is Salvage Style Party day! Beautiful logo created by the very talented Kerryanne English from Woodberry Designs. Thanks Kerryanne! I am joining 8 other bloggers who all are geniuses at coming up with new purposes for old objects in a Salvage Style party. I am sure all these talented ladies have created the most beautiful and original projects for this special day. And a bit of fun…. I agreed to join this party months ago. Of course I had the biggest ambition to come up with the most wonderful project for this party. But as time went on, inspiration was nowhere to be found. I wandered into the basement and the shed on numerous occasions looking for that one perfect bit of junk I could restyle into a treasure. Nothing lit a spark in me. Than one day, I could hear the voice of a very wise and wonderful lady in my head (a true junk style queen called Donna) “I always look around my house to see what I actually need when I set out to do a project”. Well I was reading this wonderful advice as I was sitting in my craft room, and I didn’t have to look far to see what I desperately needed: a bit of organization in my life. Washi tape organisation to be exact. And that is when the light bulb started flashing and an idea was born. A couple of years ago, just before Christmas I sent out a call to all my friends. I asked them to keep the wooden wine boxes that might come their way at the end of the year and give them to me. I’d be happy if they would still be filled with wine ;-), but I would love them equally if they were empty. Lots of my friends heard my call, so I am now the happy owner of at least 20 different wine boxes. Some have already been put to good use as simple paint organizers in the basement, there is the one that I gave a vintage makeover and that is holding our remotes, and yet others are waiting for a new purpose in life. One box is now working hard as a washi tape organizer DIY. And it was so simple. Take your wine box and drill two (singe bottle box) or four (double bottle box) holes, big enough for your stick or dowel to pass through easily. Make sure the holes are at the same position on the front and back. Saw your dowel to size. Make sure it sticks out about two inches on one side. Glue or screw your stopper to one end of the rod(s). I had two drawer knobs in my stash. But big buttons, beads or something like a cork would work well too. Paint the box to your hearts desire. I obviously went for stripes. I used varnish first on the outside and then used white paint to paint the inside and the stripes. Such an easy construction. This is the backside obviously. For some reason I felt it necessary to arrange my washi tape in a rainbow….. I choose not to add anything to help with tearing the washi tape. I have seen people use the hard edges of a box of aluminum foil for that. I prefer to use scissors anyway so I didn’t bother. Repurposed and upcylced at its best: A salvage style washi tape organizer DIY. Perfect for a little organization in my craft room. You know what else is perfect? The other projects in today’s Salvage Style Party! If you can’t see enough Salvage Style projects than check out our Salvage Style Pinterest Board. My craft supplies are so scattered and disorganized. The tape organizer is giving me ideas. Love it! Brilliant! 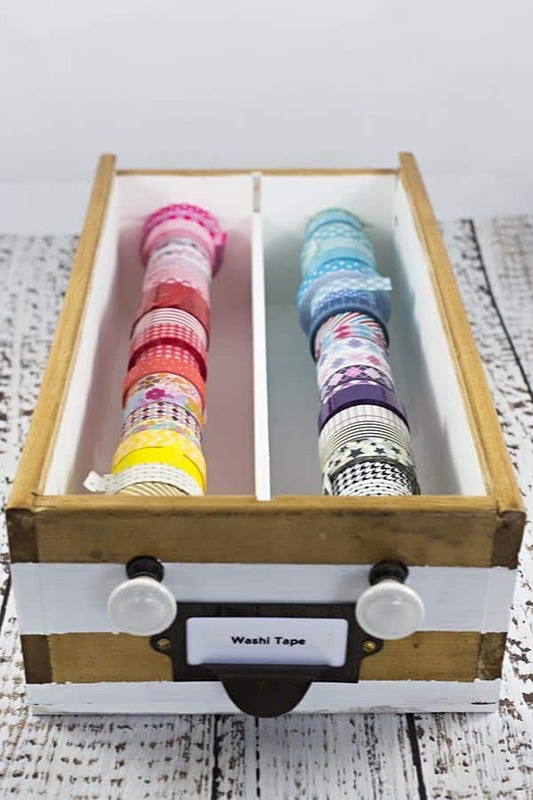 What a great way to keep your Washi tape organized. It’s always so much easier to create when we know exactly were to find our supplies. Such a pretty box for such fun tape–makes you just want to create something! This is very cleaver Marianne! Donna gave you great advice, I find that some of my best projects are made when I really NEED something! I think I NEED one of these! Thanks for the great idea! I totally need one of these! I’m just starting to build my collection of washi tape, and have rolls sitting everywhere. Adding this to my must-make list! You are the genius! Not only is that cute, it’s an excellent way to store all the tape. Clearly I need friends with wine boxes. And wine too. I am amazed at wine boxes. I live in the heart of wine grapes. A world winery was nearby growing up. I have never seen nice boxes like these!!! Ever. In any store. And I laugh because in one certain wine country area oh a bit over an hour away, they sell all the town wineries labeled wines at the gas station!!! I Totally love your brilliant solution to tape. When it first came out, I bought rolls at special shops but then I quit. I think storage made mine get gunky. That means the glued edges got bent and dirty. I’m so impressed I’d like a box!! After this Christmas you will have to beg your friends again and secretly add to your Etsy shop!!!!! WOW!! Great idea Marianne…practical and pretty 🙂 Very inspiring!! You are so clever! This is lovely! Only you can store something and have it look like art…. Hi there, I am Marianne, welcome to my nest on the web. At Songbird I like to share my creative adventures and my love for fluffing my nest. We are a participant in the Amazon Services LLC Associates Program, an affiliate advertising program designed to provide a means for us to earn fees by linking to Amazon.com and affiliated sites. For our data disclosure policy click the image below. All content and photos © 2019 Marianne@Songbird. Enter your email and receive updates from Songbird... it's FREE!